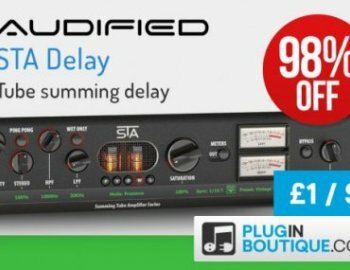 Plugin Boutique has launched an exclusive sale on Audified’s STA Delay, offering a 98% discount on the delay effect plugin for Windows and Mac. A classic effect creating delayed repetitions of the incoming signal enriched with the warmth of the Summing Tube. The STA Effects are primarily designed for using as insert effects as the tube summing process is inside the plug-in. In addition it offers the same 5 types of valve saturation as do all the STA Effects series. Classic effect creating delayed repetitions of the incoming signal. 5 types of valve saturation. Two signal paths mixed on a vacuum tube. Really unique and warm character. 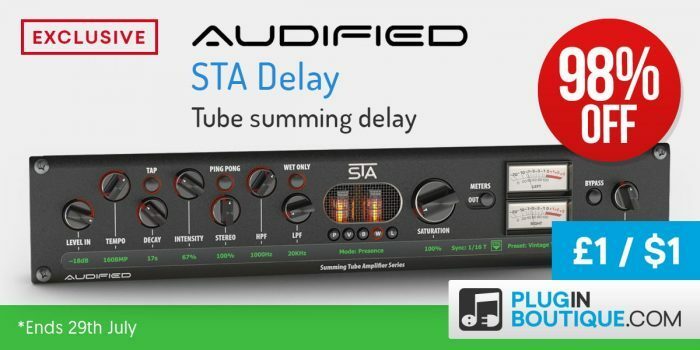 STA Delay (VST/VST3/AU/AAX) is available for only $1 USD until July 30th, 2018. The plugin is also included in STA Effects 2, alongside STA Chorus, STA Flanger, STA Phaser, STA Enhancer and STA Preamp. This bundle is offered at 40% off until August 14th.